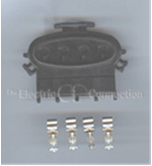 When replacing a burnt connector the part the connector attaches to as well as the connector itself have to be replaced at the same time in order to have a successful repair. If you only replace the component or the connector it will fail again very quickly. It is also useful to check current draw on the burnt wires.